Bitlocker was introduced when Vista was in the works, and Bitlocker became one of Microsoft’s key feature in pushing Windows Vista to the corporate customers. For the people who doesn’t know what Bitlocker is: Bitlocker is a drive encryption technology by Microsoft. Unlike EFS (Encrypted File System) which is a file level encryption technology, Bitlocker will encrypt the entire disk or volume or partition. OS and data files would be encrypted. If you need a full disk encryption but do not have the $$$ to purchase any of the above Windows Vista license, introducing – TrueCrypt 6. TrueCrypt 6 is a full disk encryption just like Bitlocker, but it can do more than Bitlocker (sorry Microsoft!). Depending on the password that you input during the bootup, TrueCrypt will load the respective operating system the password corresponds to. So if you are being “knife-pointed” and was asked for your OS password, you can provide the thelf/attacker the password to load a not-so-important-operating system. Savvy? – Different password to load different OS VS Bitlocker: Can only protect one OS/Not so straightforward if 2 or more OSes need to be protected. – Type of encryption can be specified VS Bitlocker: Microsoft sets the Encryption for you. – Too many options – Normal users tend to stay away VS Bitlocker: Straightforward process. – Not easy/Not hard to setup VS Bitlocker: Easy to setup if using Bitlocker Drive Preparation Tool. So which one do you prefer? Which is better? Why? Have your say! Microsoft’s January patches are now out. The update includes three critical patches that fix flaws in Excel, Outlook, and Internet Explorer. All of these allow remote code execution and can be used as a vector for virus or trojan attacks. At the moment,Â anti-virus vendors such as f-secure haven’t seen malware taking advantage of these vulnerabilities. Windows XP SP2 Update KB917021 was published on October 17th 2006. What’s that you say? It’s an update to “help prevent the Windows wireless client from advertising the wireless networks in its preferred networks list”. Those of you that travel with confidential information might want to investigate this patch. It wasn’t included in Microsoft’s monthly updates. Advertising the name of your preferred networks creates the potential for a man-in-the-middle attack. This patch won’t stop your Windows notebook from using a spoofed network, but it will fix it so that the hacker would have to guess the name. You can find more details on this from Brian Krebs and Knowledge Base article 917021. You can download it from Microsoft’s Download Center â€“ Validation Required. This update is further to the ones that were released on Tuesday where several code execution vulnerabilities. However December update does not include a patch for the number of recently discovered Word vulnerabilities. I don’t use Gmail – I’m a Windows Live Mail user (but of course…) and only use Gmail for competitor reviewing and suchlike for my work. 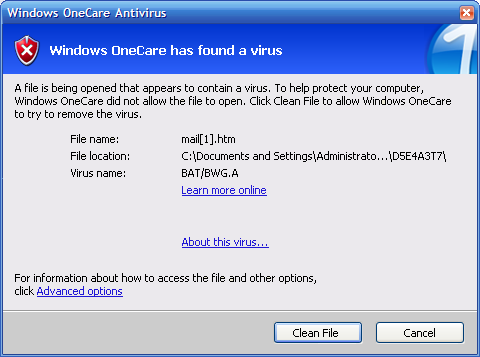 I logged in today and to my surprise Windows Live OneCare jumps in and tells me it’s detected a virus… actually on the main Gmail page after I entered my credentials. Apple Support has a very interesting notice available today. It seems that some of the iPod (video) units available for purchase from September 12th contain the RavMonE.exe virus. More details are available from: http://www.apple.com/support/windowsvirus/. Also of interest is Apple’s framing of this support issue. Note that the notice is located in a sub-folder named “WindowsVirus” rather than “virus”. In fact, the words “Windows Virus” appear eight times while the name of the virus – RavMonE.exe – is mentioned only twice. Let’s be clear, some Apple iPods have shipped with a virus that affects mass storage devices. So it might not be a Mac OS or an iPod issue. But this is an Apple issue, not just Windows. “Small number”, “less than 1%”, “less than 25”, and “easily restore” are also mentioned frequently in the notice. With more than eight million iPods shipped in Apple’s third quarter we would be interested in a raw number for that 1% effected by this. What’s one percent of a few million? Posted in Security, Uncategorized | Comments Off on iPods shipping with Virus’s!